1. They have two Maryland locations (Silver Spring and Takoma Park) that are Metro-accessible and have plenty of parking nearby. 2. At both locations, the classrooms are well-kept, clean and spacious. The second you walk in to the studio you immediately sense that it is a space where you can set aside your anxieties and immerse yourself in your practice. 3. They have friendly and informed staff members and teachers who will make any new (or old!) person feel welcome. They can also provide guidance for the budding yogi who may have any concerns or special needs. 4. Their classes are run by sessions (like a semester) so that a student commits to a class (same yoga style, same teacher and same time every week) which encourages progressive learning. Each class builds on the skills learned from the week before. But don’t worry – make-up sessions are allowed if you happen to miss a class. 5. Before the start of any session, they offer a week of free classes so that you can “try out” a class before committing to it. 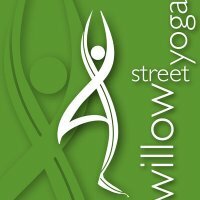 Have you been to Willow Street Yoga? What was your experience with them? Do you have a teacher you would recommend to others? Let us know! Disclaimer: I am not an employee of Willow Street Yoga and did not receive any payments for this post.